It all started with a beer. A beer that turned into two, then red wine, then I think whiskey? Then back to cider for some reason (honestly, why?). Followed by Jäger, gin and tonic, and other various concoctions – I’ll leave the rest up to your imagination. In any case, it was the reason I found myself tremendously, inconsolably hungover right before my planned trip to Trentham Falls (the largest single-drop waterfall in Victoria at 32meters). My mate Ben, who I’d met in Tassie (you might recognise him from my trip to Mt Field National Park to see Russell Falls, Horseshoe Falls and Lady Barron Falls) was picking me up at 10am, at which point I was lying in the fetal position on my couch, a glass of undrunk Berocca in front of me. So I guess my first tip is: don’t go out drinking before going for a 1 hour car trip to see a waterfall. Ben was in the driver’s seat, laughing his head off at me every 5 seconds. I have to admit, it was pretty funny. Here we began our journey to the falls. The path to view the falls is very short, and not difficult at all – though there are a few stairs, they’re not very steep. I was quite thankful for this, my headache raging and my body devoid of energy. We continued down, where much of the path is fenced off for your safety. Soon we reached the top of the falls, though there is no access to them. The reason being, Trentham Falls are, according to the signage, ‘nature in action’. Formed 5 million years ago when a volcano in Newbury erupted, molten lava caused the earth home to the Coliban river to collapse. Since then, Trentham Falls has flowed ferociously, with spray eating away at the rock face behind it. This means that this magnificent creation will one day collapse on itself, and be gone forever. I find it so fascinating to visit waterfalls like this, knowing that one day it won’t be the same as what it was when I went. Visiting the top of the falls wasn’t quite enough for us (despite my hangover, which was making me very nauseous and shaky at this point, Ben chuckling once again). So, we decided to venture to the bottom. Now as you can see, access to these falls is actually forbidden now, though there are clear paths down to their base. These old paths are now blocked off because there are tell-tale signs (such as water dripping from the sides of the rock, and cracks appearing) that parts of the rock face could collapse at any moment. So I’ll say this once, loud and clear. TRAVEL AT YOUR OWN RISK. This is a very dangerous thing to do, and you just never know what’s going to happen and when. For me, I figure that if a rock face like that collapses while you’re under it, it’s pretty damn unlucky and it was probably your time to go. But I’m in no way, shape or form, suggesting you slide past the blocked-off gate like we did and travel to the bottom. But anyway. That’s what we did. The thin, rocky & tree-root invested path snakes it’s way down the hill to the base of the falls. I found a spot to set up my tripod, and good ol’ Ben once again became victim to my photography obsession. He pressed the shutter release button for me once I had scrambled down to the falls (it was very steep and muddy, so take care and wear proper shoes if you do venture down). Luckily I had worn my Hunter gumboots so I could stomp in all the water I pleased. It was my first time using my Hoya ND 8 stop filter, so I was pretty excited to take photos. I stood in the cold water in my gumboots and experimented with all the different angles. The bottom is pretty magical, I will admit. The force of the falls causes immense whips of spray to ricochet into the air. And of course, I climbed my way underneath them so that I could stand behind the falls. (Again, do NOT recommend this. But it was awesome). This was my first time standing behind a waterfall. I had to trudge through unbelievably squelchy, slippery mud to get to this spot, but it was worth it. Looking out at the valley from behind the falls was something else entirely – a feeling I can’t quite describe. And it was then that I realised my hangover was gone. The fresh, gushing water and beauty of the falls had made it vanish into thin air, much like the spray from the falls. And that’s how I discovered the best way to get rid of a hangover. Out in the fresh air, surrounded by nature, with the water gushing and cold sprays landing delicately on my face, all my worries washed away. I was revitalised and reborn, ready to face the city once again. And I think that accurately depicts just how powerful nature can be. Looking for more waterfalls to visit in Victoria? 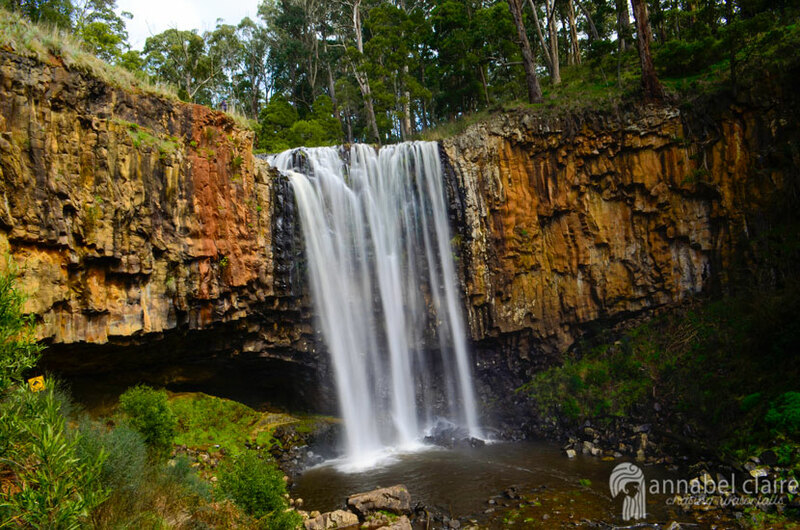 Try Turpins Falls in Langley, or Masons Falls and Wombelano Falls in Kinglake National Park. On the other side of Melbourne try Olinda Falls in the Dandenong Ranges. And if you’re up for a road trip, there are plenty of falls in Lorne, try Erskine Falls, Sheoak Falls or Cora Lynn Cascades. Great story and great photos. I love your enthusiasm for waterfalls. And I agree that the best way to experience a waterfall is to get amongst it. I have often ( when appropriate) strip off and showered under waterfalls that I have come across. Your comment about it heading for collapse is so true as in geologic terms waterfalls are only temporary structures and are continually on a course of self destruction. Keep up the good work. Thank you so much! Yes, I definitely agree with that, and have done the same in some circumstances. It’s so fascinating to think that they won’t be around one day, we are so lucky we get to experience them and soak them in! bit. Will tһere be a part 2? My husband and i got quite more than happy that Raymond managed to carry out his investigations through the entire precious recommendations he had through your blog. It is now and again perplexing to simply choose to be releasing tactics which often most people may have been making money from. So we discover we’ve got the website owner to thank for that. The most important explanations you made, the simple website navigation, the friendships you can aid to foster – it is all terrific, and it is letting our son and the family reckon that that article is thrilling, which is certainly tremendously indispensable. Thanks for the whole lot!